PHILADELPHIA (June 22, 2018) — How can a live event bring disparate parts of a community together in a new way? What happens when neighbors cross invisible divides to meet in real time, unmediated by social media or smartphones? Beginning July 1, AIR will dispatch five #LocaloreLIVE grantees to figure it out. AIR, a nonprofit network of independent producers, public media journalists, podcasters, artists, and creative talent, is awarding new grants for #LocaloreLIVE, a national series of live events launching July 1 to reconnect communities across political, economic, geographic, linguistic, and other divides. “It’s thrilling to see the field of Localore continue to engage local communities and deepen public media’s relationship with more people,” said AIR Board Chair and KCRW President Jennifer Ferro. “AIR’s continuing support of rising talent is vital to the future of public media.” This is AIR’s fourth Localore initiative since 2010, with more than $5 million in new funding directed to independent talent and hundreds of station and community collaborators working to expand and strengthen public service media. AIR also recognized three “Honor Roll” producers whose exceptional leadership and vision stood out from the highly competitive field of applicants: Free Egunfemi (Richmond, Virginia) is an organizer and street artist who was a community collaborator in AIR’s Finding America: UnMonumental production. She is shifting the script on her city’s history. Veteran public media leader Ruxandra Guidi (Los Angeles) will work to bring a neighborhood together to celebrate older adults in the central, working-class area of MacArthur Park. Community organizer Annie Le (Boston, Massachusetts) focuses on the other end of life, building an oral history of childhood with story collection points for the Vietnamese community in Boston’s Fields Corner neighborhood, where AIR is headquartered. #LocaloreLIVE’s grantees and Honor Roll multimedia work will be captured on the Localore.org metasite, joining hundreds of other stories curated from AIR’s previous Localore productions. A social community will be cultivated via #LocaloreLIVE as the projects unfold. AIR kicked off #LocaloreLIVE on Thursday, June 21, with “Finding Sanctuary: Stories from the Community” at the historic George W. South Memorial Church of the Advocate in Philadelphia, and streamed live, and available still, on Facebook on AIR’s Facebook page. This public media collaboration brings AIR together with Public Radio News Directors Incorporated, WHYY, community storytellers, and local independent media makers from across the region. #Localore LIVE! is made possible with principal support from the Wyncote Foundation and the John D. and Catherine T. MacArthur Foundation, and additional support from the Corporation for Public Broadcasting, the Ford Foundation, the National Endowment for the Arts, and the New York State Council on the Arts. 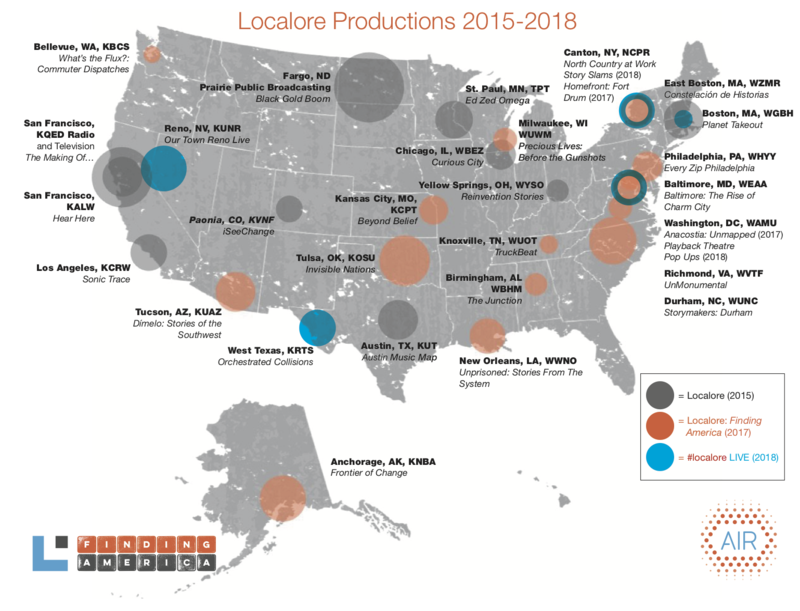 Localore is a national initiative deploying intrepid independent producers to communities large and small, and embedding them at public radio and television stations with the goal to expand public service media to more people in local communities. Each local initiative production represents a sustained collaboration between local public media journalists, independent makers, and people from the members of the community whose stories AIR seeks to elevate. The iterative models and best practices are captured in a series of reports, including a 2017 publication, “Break Form: Making Stories With and For the People,” available at AIRmedia.org. AIR celebrates its 30th anniversary year with a growing network of mission-focused talent integral to public broadcasting and America’s growing podcasting and streaming audio industry. More than 1,300 journalists, podcasters, documentarians, technicians, and media entrepreneurs forming AIR’s creative community span 46 states and 30 countries worldwide. AIR’s recruitment and mentoring programs and its national productions enrich and expand the ecosystem where storymakers create work that brings hope and enlightenment, with the power to embolden and unify.